People come to poetry with all sorts of preconceptions: it has to be complicated, it has to rhyme, or it is just not for me. 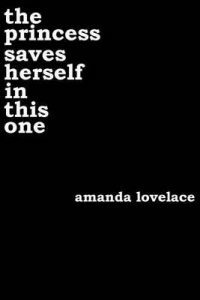 A crop of up-and-coming writers has helped new audiences find appeal in playing with expression, and Amanda Lovelace’s Women Are Magic series sparks strong reaction. The Princess Saves Herself in This One taps into feeling and thought and trauma and joy in a way that speaks to those who struggle to feel seen or understood. It faces hard things without giving them additional power, and it clings stubbornly to youthful hope. With forewarnings both for sensitive topics and for happy endings, this inaugural collection offers energy and accessibility. Welcome to National Poetry Month!